Although there’s been much talk about the financial barriers millennials face when it comes to homeownership, BuildZoom’s report shows that this age group, along with the up-and-coming Generation Z population, are willing to bear the high housing costs of coastal metros in favor of better career opportunities. 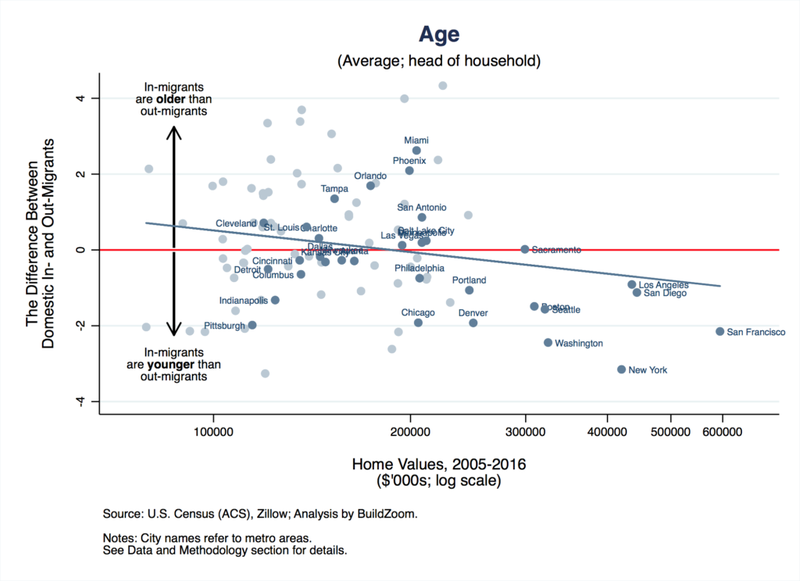 Younger in-migrants are able to offset housing costs by living with roommates (this group is more likely to have multiple earners per household), and in-migrants to coastal metros are more likely to be renters than people who leave those cities for cheaper costs of living. On the other hand, retirees are flocking to Miami, Orlando, Tampa and Phoenix where home prices and the overall cost of living is more affordable. 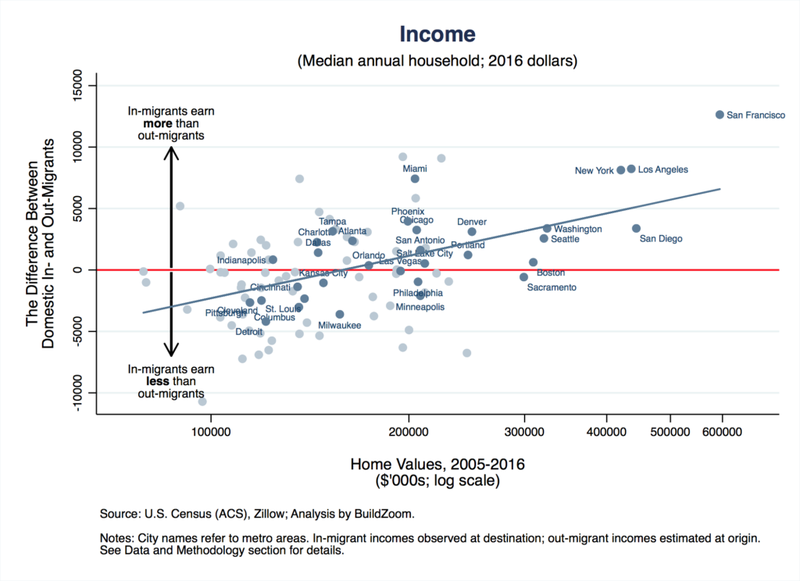 As expected, in-migrants to expensive metros tend to be more educated, since they’re well equipped to take advantage of job opportunities in tech and finance hubs. 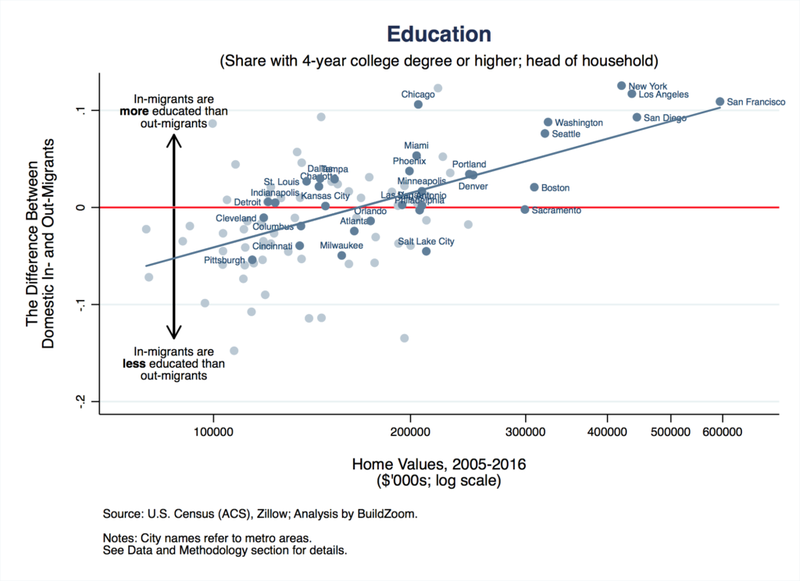 Conversely, the in-migrants to Rust Belt cities tend to be less educated than former residents. While this is great news for expensive metros looking to attract talent, Romem says it keeps cities such as Pittsburgh, Cincinnati and Cleveland behind. “The quality of an institution like Carnegie-Mellon and its implications for its graduates’ ease of moving elsewhere, for example, could help explain why the difference between in- and out-migrants’ education levels in the Pittsburgh metro area has been negative,” Romem added. Romem says each of these demographic factors — income level, age and education — are closely tied with a metro’s home price growth rate, the share of renters vs. owners in a city and its ability to sustain growth. For now, these expensive metros are leading the economy, but as home prices continue to break and reach new peaks, Romem says employers will be forced to keep only the highest producers and forgo, automate or relocate other positions to more affordable locales. Although this is a scary possibility, the BuildZoom chief economist said the solution is clear: build more affordable housing. This study uses data from the American Community Survey (ACS) and from the Zillow Home Value Index. In particular, it relies on individual– and household-level data from the 2005-2016 1-year ACS files, and on county-level ZHVI data. In order to avoid conflating migration between a narrowly defined metro area and its immediate surroundings as cross-metropolitan migration, this study uses the broadest (standard) geographic definition of metros available. Specifically, it uses Consolidated Statistical Areas (CSAs) wherever they are available, and for metro areas that do not belong to a CSA, Core-Based Statistical Areas (CBSAs) are used.